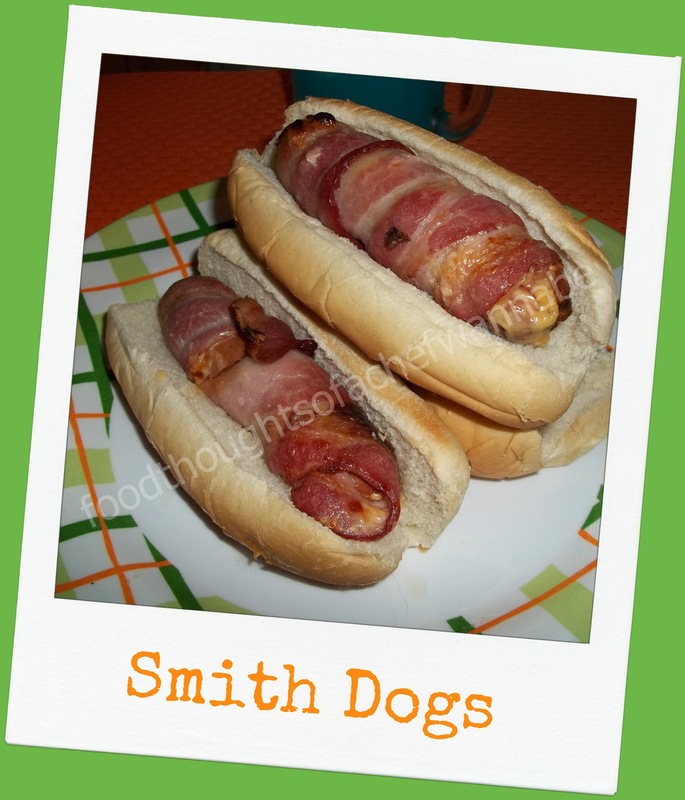 FoodThoughtsOfaChefWannabe: Hot Dogs...Smith style. SMITH DOGS! Hot Dogs...Smith style. SMITH DOGS! Aren't there just some things you can do as an adult that you couldn't as a child, that make you think, "HA HA" to your parents? Growing up in a large family, money was always tight. My mom would buy the cheapest hotdogs known to man. Only God knows what was REALLY in them and if you know, please, keep it that way, I don't need to know, I can only imagine. Anyway, she would try cooking the on the grill, boiled in water, later the microwave. Anything to make them taste better. She succeded. These are no way healthy, so if that is what you are looking for, you should go to a different recipe! These were just something my mom made to make ingredients streeeetch and do the best she could in the kitchen for a huge family! I called her tonight telling her what I was making for dinner. Ultimately it was only because I had some leftover hot dogs to use up and had what I needed. She told she can't remember how this idea was born but we laughed over how we could only use 1/2 slice of bacon per hot dog back in the day. We had to make food go as far as we could and so half a piece of bacon it was. This was my "HA HA" moment. As we laughed I said, "One thing WILL be different mom, I will be using an ENTIRE slice of bacon"! We laughed some more and reminisced some more. Funny how you remember little things like that. I did do the cheese the same, I mean after all, I couldn't change everything! These are so easy to make it almost seems a ridiculous post. However, sometimes the easiest and simplest things are the best! You can make these with uncooked hot dogs or already cooked ones. You could change it out to sausages or my choice would be all beef hot dogs. I just wanted to make them like my mom did for you guys. You could change your cheese out to real cheese instead of cheese slices too! Lets get started on this easy but tasty way to serve a hot dog! Prepare your cookie sheet first. Cover in foil, and if you want you can use your broiler pan because these will get put under the broiler. It just makes cleanup easier and I am all for easier cleanup! Now take your cheese slice(s) and cut it into strips like this. I got 6 strips from each piece. Cut your hot dog down the center, not all the way through but the entire length. Tuck in a piece of cheese. You could use cheddar or any other cheese as well! Do this with all of the hot dogs. The only thing left is to take a piece of bacon, and carefully wrap each hot dog in it. Starting at one end and wrapping it so it covers the hot dog completely. Make sure that you end on the bottom or enough on the top for the bacon to stay put! Place on your baking sheet of choice. Set your oven to BROIL. Keep the door open slightly and broil for 6 minutes. Remove and flip the hot dogs, and broil for another 4-5 minutes. If you want crispier bacon, add 1-2 minutes per side. Serve alone or on a bun!!! These are so much better than I remember them as a kid. I haven't eaten on in 20 years at least and I probably won't make a habit of making them to often, but I have to always share dishes from my childhood. I wish they were healthier, but they aren't. I think I could do the same thing with little smokies for parties. We just had dogs two nights ago! We don't do them often, but an all beef hot dog on the grill with some melted cheese on them? Heeeaven! I was looking at one of the pictures and my mind went, Holy crap, the cheese is IN the bacon. Yea, man! I will definitely try this! Hi! Following you from TGIF Blog Hop! I would appreciate the follow back! Have a great day!